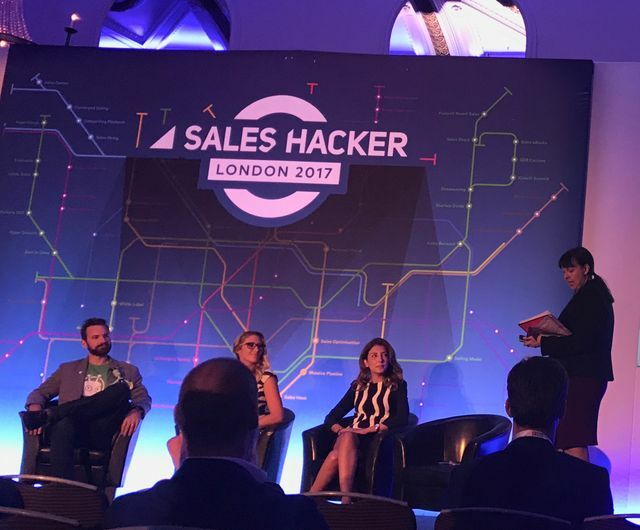 I have spent the day at Sales Hacker 2017 in London. It was a very insightful event involving hearing sales leaders sharing their insights and stories of best practices in enterprise SaaS sales. Having worked in enterprise sales at Symantec for a number of years, I could not agree with this more. I was definitely guilty back then of being the unenthusiastic sales rep for marketing driven ABM campaigns, main reason being the campaigns had little or no sales involvement. It was easy to shrug it off as another marketing effort that won't have a real benefit for me. Jason Sibley (CEO @Creation Agency), panelist from another session (alongside Jack Kosakowski @Creation Agencyand Glenn Gaudet CEO @GaggleAMP) made a bold suggestion that marketing should really be part of the same team as sales and carry the same sales quota. Might be an extreme angle to play out in a large enterprise, but the statement does highlight a fundamental issue with how traditional marketing and sales teams function - most organisations create the two teams with different measurement for success. The result is a disconnect between how one function can help the other on what should be a common goal - driving revenue. I think activities carried out by sales and marketing should not be defined so much by its function, but focus on the same outcomes. For example, for marketing to create content as driven by sales, or enabling sales reps to create authentic content themselves to drive business. Ultimately for ABM initiatives to really work, it should not be about marketing, everyone needs to be involved.